You will be able to calculate feeder sizing, circuit load totals, fault current calculations, voltage drop, breaker sizing and photometrics. Design Master allows you to build panels and transformers. You may then display upwards of 20 different pieces of information about each device on the one-line riser diagram. Design Master records how each panel is built and how they are all connected, fed, and protected. You can then display the breakers on the one-line riser diagram. Move the one-line devices and feeders around the drawing with AutoCAD grips commands until you have the one-line just how you like it. Show the size of a single feeder or all the feeders on the one-line riser diagram. You may create new blocks to represent all the one-line devices, including panels, transformers, breakers, fuses, and more. Make the one-line riser diagram look like your own. Panel schedules are created with all the important information shown at the heading. When a circuit is changed on a floor plan, the panel schedule is updated automatically, so nothing is ever forgotten. Panels know how they are connected to each other and the load from the branch panels will carry through all the way back to the main service entrance. Design Master sizes the breakers and tracks the circuit loads as you design so that you can focus on other aspects of the engineering process. Design Master allows you to combine multiple circuits into a single homerun. When combining homeruns, Design Master has an option where it will automatically share neutral wires between the combined circuits whenever possible. Tick marks can easily be added to loops other than the homeruns. The tick graphics can also be customized. Any homerun that uses #12 wires will have tick marks inserted automatically. Junction boxes can be used to provide an even more detailed image of how each circuit will be wired together. This can be used to create accurate shop drawings for electricians in the field. Any homeruns with wire sizes large than #12 will not have tick marks, but instead will have the wire and conduit sizes printed out on the drawing. No two engineering firms use the exact same blocks for their light fixtures. Design Master makes it easy to customize our blocks to match your exact standards so your drawings can keep the look and feel that your customers have come to expect from your firm. Light fixtures can be manipulated with normal AutoCAD commands. No special buttons are required. This reduces the learning curve and allows you to start right up with the commands that are already familiar to you. You build the lights for use in your project, and then Design Master will compile them into a comprehensive schedule on your drawing. Design Master allows you to fully customize the look of your equipment blocks and match your company's current standards. Depending on how much information you prefer to display, or how much space is available on a drawing, you can choose to show just the callout, or show all the load and voltage information. This means that you can create any type of equipment imaginable. Air handlers, refrigerators, elevators, exhaust fans, ovens, and more can easily be built with Design Master. Design Master allows you to design lighting layouts with dual level switching, and then clearly convey that information on your floor plan. Once you assign a light fixture to a switch or switch group, the light will self-edit when you make changes to the switch. This box gives you the ability to check out each room with a quick glance. Use Design Master to trace the architect's background and add photometric information to the rooms. Attach IES files to the light fixtures and Design Master will compute accurate foot candle levels. When an architect alters the layout of their rooms, Design Master allows you to easily modify your rooms to match, and then redo the calculations. Just use the AutoCAD grips or stretch commands. Design Master completes the entire photometric process within the format of AutoCAD. There is no need to transfer files from dwg format to dxf format to do the calculations, and then back again to produce design drawings. Create realistic landscapes with buildings, trees, and other obstructions to simulate the site plan. Design Master uses all of the information you have entered to automatically calculate the fault for you. Design Master calculates the fault, but the final AIC rating is left up to you. We have the software do as much of the work for you as possible, but leave you in control of the final design. All of the devices on your one line are tracked in our database. The schedule includes a column for the voltage drop of each feeder. Design Master displays the circuit with the worst voltage drop for each panel. You may then go back into your design to fix any problem circuits and run the calculation again to see if everything is solved. The schedule includes a column for the total voltage drop, which is the sum of the feeder and the branch voltage drop. Design Master can now link a project database to an Excel spreadsheet. You can gather any information from the database you like, and put it into a spreadsheet. This allows you to do material takeoffs straight from your design. No more counting lights, receptacles, or breakers with a yellow highlighter and a notepad. The database has already counted them for you. · A computer system capable of running AutoCAD 2004 or later. · AutoCAD 2004 or later. This includes AutoCAD 2004, 2005, 2006, 2007, and 2008. · Screen resolution of 1024x768. · A Microsoft Windows server. · Final output has some text randomaly replaced with "Design Master". 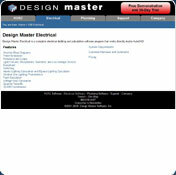 You cannot download any crack or serial number for Design Master Electrical on this page. Every software that you are able to download on our site is legal. There is no crack, serial number, hack or activation key for Design Master Electrical present here. Our collection also doesn't contain any keygens, because keygen programs are being used in illegal ways which we do not support. All software that you can find here is freely downloadable and legal. Design Master Electrical installation package is prepared to be downloaded from our fast download servers. It is checked for possible viruses and is proven to be 100% clean and safe. Various leading antiviruses have been used to test Design Master Electrical, if it contains any viruses. No infections have been found and downloading Design Master Electrical is completelly problem free because of that reason. Our experts on malware detection tested Design Master Electrical with various spyware and malware detection programs, including fyxm.net custom malware and spyware detection, and absolutelly no malware or spyware was found in Design Master Electrical. All software that you can find on our servers, including Design Master Electrical, is either freeware, shareware or open-source, some of the software packages are demo, trial or patch versions and if possible (public domain licence), we also host official full versions of software. Because we want to be one of the fastest download sites on the web, we host all the software including Design Master Electrical on our servers. You cannot find here any torrents or download links that would lead you to dangerous sites. Rate Design Master Electrical 7.0.1!